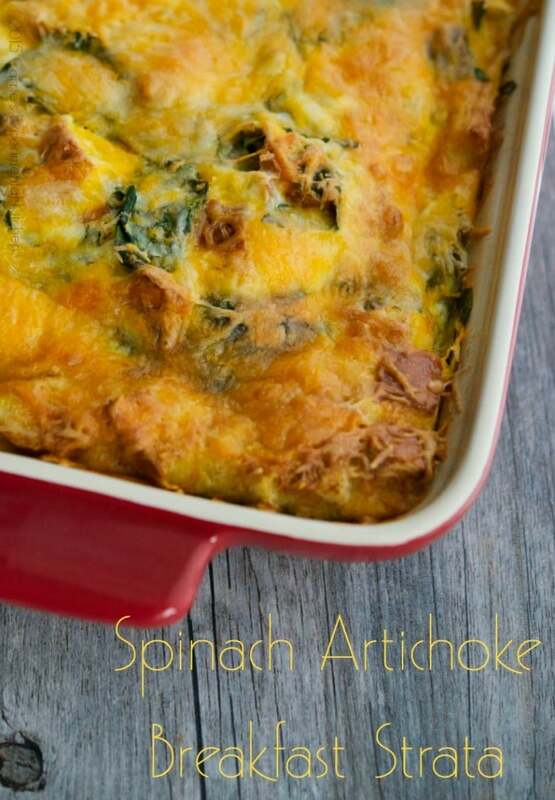 This savory Spinach Artichoke Breakfast Strata is wonderful. It’s so easy to prepare and fantastic when feeding a crowd for breakfast or brunch. Mother’s Day is coming up and I’m not quite sure how it originated, but somewhere along the way it also became synonymous with breakfast or brunch. Though I’m partial to a family barbecue or a nice dinner out on this day, I think I may have to rethink this brunch thing now that I made this Spinach Artichoke Breakfast Strata. 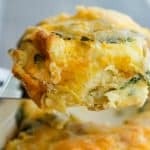 A strata is similar to a quiche or frittata; however, it’s made of a mixture of bread, eggs, cheese and whatever flavor combination you can think of; think savory bread pudding. For this breakfast strata, I combined day old Italian semolina bread, fresh spinach (you could use frozen), artichoke hearts and half of the Cheddar Jack cheese; then placed it in an oven-safe casserole dish. Next, I combined the eggs and milk and poured it on top of the bread mixture. Make sure you use the back of a spoon to soak the bread into the eggs; then sprinkle the remaining cheese over the top. You can bake it right away or let it sit overnight in the refrigerator until your ready to heat and serve. 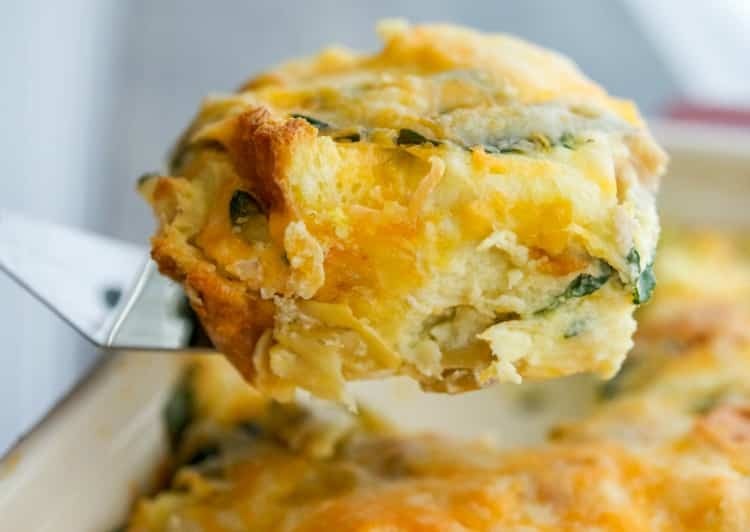 This Spinach Artichoke Breakfast Strata took only 10 minutes to prepare, about 45-50 minutes to bake and serves 12 people more or less depending on if you’re serving it alone or with other brunch items. Because this recipe is really easy to prepare, it is also the perfect starter recipe to enlist the kids help. Have an adult cut the bread into pieces and take it in and out of the oven and the kids can do the rest! They’ll feel great being able to please Mom and she will love being served breakfast in bed made by her special little angels. ~Enjoy! 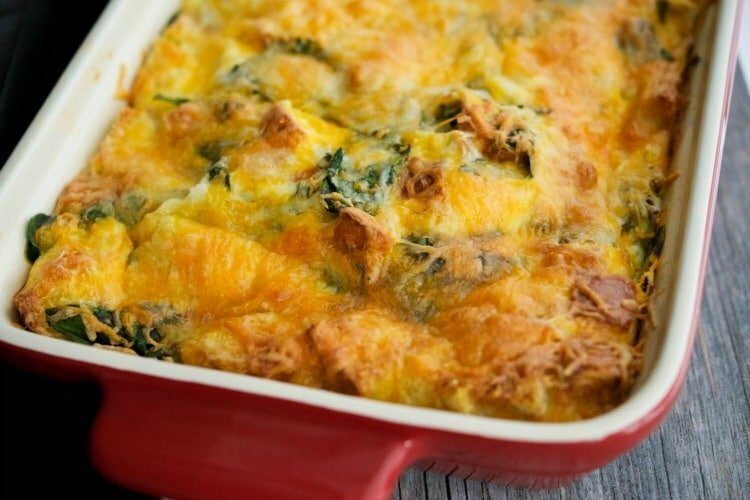 This savory Spinach Artichoke Breakfast Strata is wonderful. It's so easy to prepare and fantastic when feeding a crowd for breakfast or brunch. Cube the bread into bite size pieces and add to a large bowl; then add the spinach, artichoke hearts and half of the cheese. Mix well. Add the mixture to an oven safe casserole dish. In a separate bowl, whisk the eggs and milk together; then pour over the bread mixture. Use the back of a spoon to soak the bread into the egg mixture; then sprinkle the remaining cheese over the top. You can bake it right away for 45-50 mintues or let it sit overnight in the refrigerator until your ready to heat and serve. If you don't have fresh spinach, you can use frozen chopped spinach that has been defrosted and drained. I am absoliutely starving for breakfast after seeing this. Wish this is what I had to eat.